A Shirley Temple dress sold at auction, also a Pelham Puppet Clown, and more …. 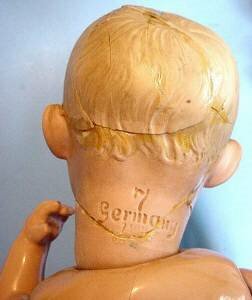 Here is the fifth May history installment of many doll and doll related online auction sales. Hopefully, many questions about values can be answered here and in the up-coming additions to this website. For those of you planning online auction sales, this may serve as a guide as well. We are also interested in your online selling experience, whether it be VIA online auctions, or just a straight selling web site, perhaps your own website. 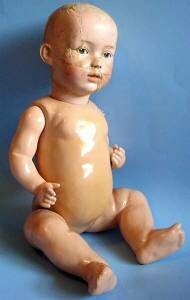 If it was sold on your very own website - include you website URL and we will provide a link from our site to yours - please, it needs to be an antique and collectible doll site. 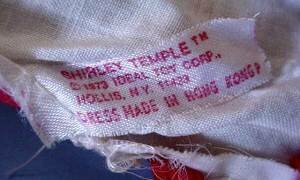 1973 tagged Ideal Shirley Temple dress. As found.....needs refreshing. 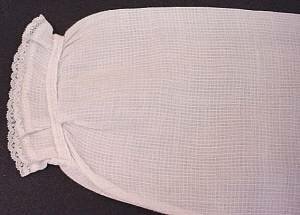 Nylon organdy with attached cotton slip. 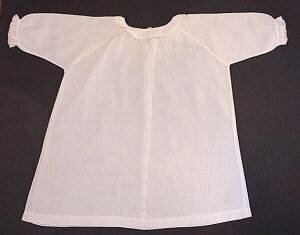 Sleeve elastic stretched. Approximately 6 1/2" long.......3 1/2" across shoulders......8 1/2" waist circumference. Think this fits a 16 to 17" doll. You will need to wash.....small spots on front....overall light age soil. Click on "Shirley Temple dolls" to see current active eBay listings, you will need to be registered in order to see completed listings. Straight from an estate sale this past weekend.......but I have to get him out of here now. It is all I can do to keep from soaking that old dark glue off and gluing him back together again. BUT......I know there are talented ladies that restore beautifully........and he really needs help. Bisque head.....composition body. His body is beautiful.......excellent condition. He is approx. 14 1/2" long.....his body alone approx. 10 1/2". 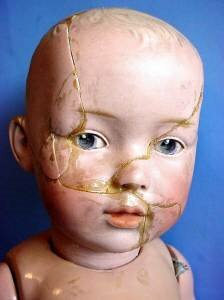 Very old glue holding his very broken head together. Missing a triangular piece on top. Head dirty......as found. If I clean him......I soak him.....I glue him......I keep him. 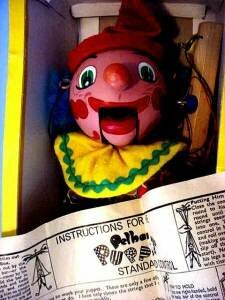 I haven't any idea the age of this scary Pelham Clown. Box is crushed and missing cellophane from storage. Comes with "untangling" instructions.....application to Pelpup Club. 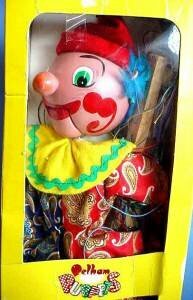 Clown has great bright color.......and in need of untangling. Approximately 11" tall........appears to be wood. So sweet......so simple. Tiny white on white check texture. Lace trim on sleeve and neck ruffles. 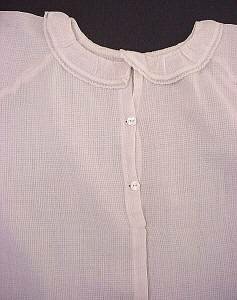 3 button back closure. ...or front? I think the buttons belong in front. Approximately 18" long......8 1/2" more or less across shoulders. This is the type that is easy to alter for large china and paper mache dolls. Looks great for big composition babies. Straight from an estate......needs minor refreshing. 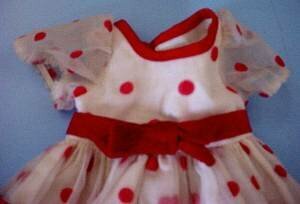 Click below to see active listings on eBay for Vintage doll clothing, you will need to register with eBay in order to see completed items. eBay is a great wedsite for "value" information about dolls, or most anything else for that matter--however, in order to see what something has sold for, registration is required, so if you are looking for past sales of any particular doll, please register. Have A Great Experience with online auctions or sales of your dolls? 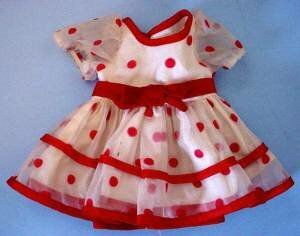 Do you sell dolls on eBay or another online auction or selling website? Did you have a good experience you would like to share? Please do! !